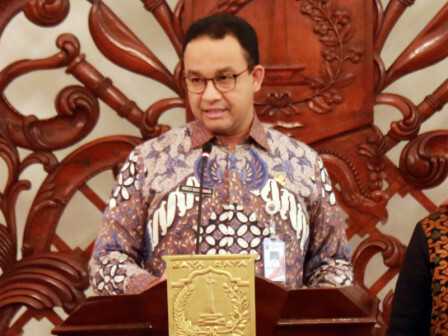 Jakarta Governor, Anies Baswedan, launched the process of integrating one-door family data and synchronizing family welfare services at Jakarta City Hall, Jalan Medan Merdeka Selatan, Gambir, Central Jakarta.
" This is the first time in Indonesia that we can integrate the process of gathering information data"
He acknowledged that family data was very basic in planning and implementing government programs. "This is the first time in Indonesia that we can integrate the process of gathering information data on cooperation between the provincial government and the Family Welfare Movement (PKK)," he expressed, Thursday (3/28). Through a long-running social program called Dasa Wisma with 70,000 PKK cadres, he explained, there was an action to collect data on the social, economic and ecological conditions of families living in Jakarta. "Dasa Wisma's data is very accurate to find out families who need more helps," he explained. Aside that his party launched the Dasa Wisma Card for the needy. "With this card, we inject donation by Rp 225,000 per month via Bank DKI," he stated. As for the information, Anies also opened this year's regional work meeting of Jakarta Empowerment, Child Protection and Population Control Agency. It was attended by City Secretary, Saefullah; TP PKK Chairwoman, Fery Farhati; Women and Children Empowerment Integrated Service Center (Dharma Wanita Persatuan Pusat) Chairwoman, Tuty Kusumawati; Jakarta Development Planning Board (Bappeda) Head, Sri Mahendra Satria Wirawan; and PT Bank DKI Director, Wahyu Widodo.